Doral, FL – As part of the Mayor and Council’s continued commitment to public safety, the City of Doral will be investing funding to design, equip and construct the technology infrastructure required for a sustainable, efficient, and interoperable City of Doral Divisional Emergency Operations Center (EOC). 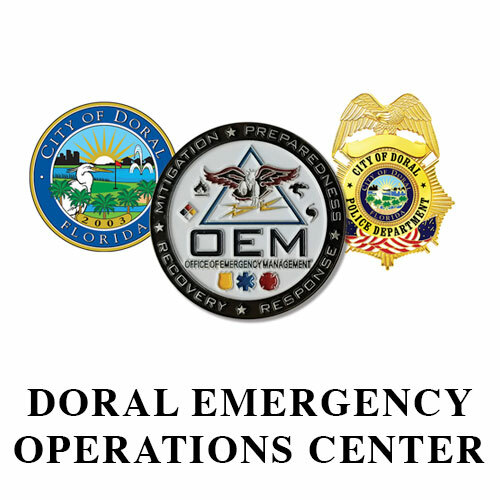 The EOC will be located within the already existing Category 5 hurricane-proof building, at the Doral Police Department and serve as the coordination hub for an incident response and recovery. The EOC will provide a central intelligence area for the City and response team personnel to gather critical information, coordinate response activities, and manage personnel during emergencies and catastrophic events to ensure an effective and efficient recovery for our residents and business owners. Following Hurricane Irma in 2017, several meetings have taken place with Miami- Dade County to discuss the establishment of a permanent EOC at the Doral Police Department with the capabilities to become a Divisional EOC. Making the City of Doral a Divisional EOC will allow the City to have a representative at the Miami-Dade County EOC, which will expedite direct communication and request for resources. A Divisional EOC will also allow the City of Doral to have different Jurisdictions and Agencies representative such as FP&L, AT&T, Red Cross, Miami-Dade Police and Fire Department, among others.